(WORT) — As its name suggests, UW Extension’s mission historically has been to extend the expertise and research developed on campuses in the University of Wisconsin System to local partners across the state. But for Carrie Edgar, Department Head for the Dane County UW Extension office, Extension plays more than just a supporting role in the university’s mission. It is the embodiment of the Wisconsin Idea. “Your county extension office”…now downsizing? UW Extension is especially well-known for the work of its Cooperative division, which partners with Wisconsin’s counties to provide educational programming (such as the 4-H youth program) in agriculture, family, and local economic development. Extension has an office maintaining services in every one of the state’s 72 counties. But that may soon change, officials say. After last year’s state budget act reduced funding to the UW System by $250 million, System administrators told Extension their share of the burden would be $3.6 million annually. The Chancellor of UW Colleges and Extension is currently reviewing a plan to eliminate up to 80 positions, nearly one in ten, in Cooperative Extension. The plan also proposes significantly scaling back on-the-ground operations by “regionalizing” county services. Once implemented, some Extension services would by administered across four-county units, instead of just one. Richard Klemme, Dean and Director of Cooperative Extension, says managing the cuts is a difficult balancing act. “We want to maintain that good balance between applied research and educational program delivery,” he says. The current recommendation calls for $1.2 million in cuts from counties, $1.7 million from campuses and applied research specialists, and $700,000 from administration. Although those numbers are not yet final, some groups are voicing concern over their distribution. A coalition of state agriculture groups has been among the most outspoken so far. Karen Gefvert, a spokesperson for the Wisconsin Farm Bureau Federation, says that her organization supports Extension’s plan to regionalize county services, but that it has sent a letter to the Chancellor urging her to prioritize funding for campus-based research specialists over county agents. “Our farmers rely on research specialists to be competitive and efficient and have the latest research and technology,” Gevfert says. But from the perspective of the Dane County UW Extension office, county agents are just as indispensable to Extension’s work, which includes not only commercial agriculture, but also youth and community oriented programming. “You need those people that have those relationships with the farmers or the youth or the nonprofits in the community, to get that information [from research] disseminated,” Edgar says. As for how the proposed cuts will affect programming in Dane County specifically, Edgar says it’s too early to say. But she’s hopeful that Dane County will not be “regionalized” because of the large population its already small staff serves. 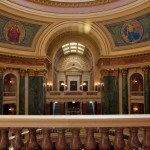 As UW Extension and its partners wait to see just where the cuts will fall, Noel Radomski, Executive Director of the WISCAPE Higher Education Policy Center at UW-Madison, wants to know why the UW System didn’t exempt UW Colleges and Extension from state budget cuts in the first place. “People keep saying, ‘Well there’s a formula for the allocation of budget cuts.’ Well, yes, but there’s a lot of subjectivity to it,” he says. Radomski says that equity should be more of a factor when distributing cuts across the UW System, pointing to the fact that UW Extension has no tuition dollars and few “unallocated reserve funds” to draw on, compared to UW-Madison or other campuses. For Radomski, the question comes down to whether UW System had enough money to hold UW Extension and College Campuses harmless against the cuts. “The answer is, absolutely,” he says. 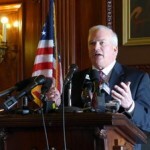 Although two Republican legislators introduced a motion to exempt UW Colleges and Extension from state budget cuts last year, those efforts ultimately fell flat. At the time, many faculty also criticized Chancellor Cathy Sandeen for not lobbying the UW System harder for fewer cuts. But Richard Klemme says that’s largely “water under the bridge” now, and that the administration at Extension has to focus on the task at hand. Chancellor Sandeen is currently reviewing feedback generated during a public comment period and is expected to sign off on the budget reduction recommendations in the next few weeks. If all goes according to schedule, Klemme expects the cuts would implemented by this July.